Awesome map of the day! Check out this cool image from John Nelson, geography/map wizard who runs a cool geography website. 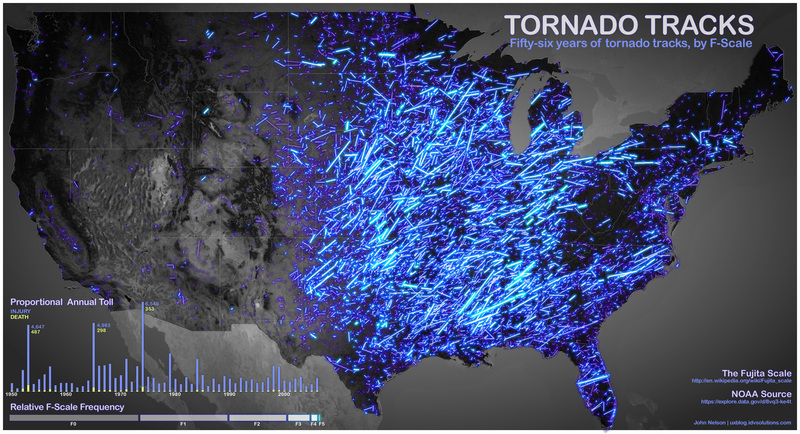 The map shows the tracks of all tornadoes between 1950 and 2006. If you step back from your monitor, you will notice a lack of tornadoes over Northern Illinois. Keep in mind, the map stops at 2006. The Poplar Grove tornado, the Caledonia tornado, and the long-track tornado from May 22, 2011 are not on the map. We know that we are “overdue” for a strong tornado here in Northern Illinois as the last F4 tornado to touch down was Plainfield, 1990. Much of northern Illinois saw a good, soaking rain this afternoon. Rockford reported nearly one inch; other areas saw a little more than an inch and others a little less. The exception was southern Wisconsin (which saw under half an inch), since the bulk of the precipitation remained south of the Stateline. For late Thursday afternoon, northern Illinois and southern Wisconsin will be socked in with rainy, raw weather. Rockford’s high temperature of 52° occurred very early this morning before dawn. Unfortunately, temperatures will remain in the 40s for the rest of the day, thanks to light and moderate rain and a cool easterly wind. The bulk of the rain has remained south of the US Route 20 corridor, however, allowing some areas in southern Wisconsin to dry out and break the 50 degree mark. By dinner time, the bulk of the rain will begin to push off to the east. We’ll still contend with scattered showers until around 11pm. Rainfall will begin during the wee hours of Thursday and continue through much of the day. Earlier forecast models painted a picture that could’ve brought an inch to an inch and a half of rain to the area. While there will be some spots that receive more than a half inch, this won’t be enough to erase the deficit we’ve been running in the month of May. Mother Nature has been temperamental lately. After achieving a record high temperature of 99° on Sunday May 27–which was also the second warmest temperature ever recorded in May in Rockford–the forecast for the end of our work week calls for afternoon high temperatures 15 to 20 degrees below normal! Between Sunday and tomorrow, the spread in observed highs will be greater than 40 degrees! A low pressure center will slide to our south through the Ohio Valley during the day Thursday. Since the flow around low pressure is counterclockwise, our wind will have an easterly/northeasterly component. As a result, our airmass will be cooled by Lake Michigan (whose temperatures are still in the upper 40s and lower 50s). Combined with clouds and on and off showers, Thursday will be chilly and raw (compared to where we have been this season). High temperatures will likely remain in the middle 50s. Areas northwest of Rockford may touch 60 degrees. Friday, June 1, is the official start of meteorological summer. Afternoon highs will again be below average. But signs are pointing to a warm up for early next week, with high temperatures returning to the 80s. The kick-off for Rockford Airfest is this Friday and most of this rain will be gone by then. Still, get ready for a chilly end to the month of May with rain likely as early as Wednesday night. The rain will be steady on Thursday with scattered showers likely on Friday. Rainfall amounts vary from one model to the next, but the average of near an inch seems reasonable. Let’s have some fun tonight at ten! On Wednesday, I will be live at Magic Waters Waterpark to debut their new speed slides! They were nice enough to give me two family four packs to give away. Instead of being lame, last week we thought ‘What if we invited four people to come out and race for the tickets! So, we’ll give away one pack of tickets during the 5pm news and the other at 6pm. Here’s how you can get in on it. I will send out a tweet right before weather at 10:00pm tonight. All you have to do is retweet (RT) it to your followers. After the 7 Day Forecast, I’ll announce the names of four people who will get an invite to race Wednesday night! Be sure you’re able and willing to race Wednesday night during either our 5 or 6pm newscast. And if you’re selected, you can still have a child, grandchild, other family member, or friend race for you. So don’t RT if you can’t be there this Wednesday between 5-7pm. 8:00pm – I’m thankful we escaped the threat of severe thunderstorms today! Not only did it allow most of us some more time to spend with family and friends outside. During our live chat here on the blog during the storm watch, may people were cheering for severe thunderstorms. I’d like to point out this photo from the Rock Co. EMS/Fire Department of a large apartment fire in Edgerton, Wisconsin. I don’t know for certain if this was caused by lightning but because the roof caved in without affecting the exterior walls, that’s my logic. Memorial Day will start off with plenty of sunshine. Areas west of the Rock River will have a few more clouds to deal with. The counties along the Mississippi River (Jo Daviess, Carroll & Whiteside) may contend with a brief shower or two, as remnants from overnight thunderstorms in the Great Plains weaken and move east. Temperatures will quickly rise into the 80s during the late morning; by afternoon, we could hit 90. A breezy southwest wind will gust over 25mph ahead of an approaching cold front. During the afternoon hours (mainly after 1pm), scattered showers and thunderstorms will begin to pop up across eastern Iowa and move east. These will be scattered in nature, so not everyone will see the rain. Precipitation amounts will be on the lower end, generally no more than half an inch. There’s a small risk that thunderstorms could turn severe. Atmospheric dynamics will allow some storms to contain gusty winds (over 60mph) and sizeable hail. Frequent cloud to ground lightning is also a threat. By 11pm, the threat for rain will come to end, as the cold front moves to our east.